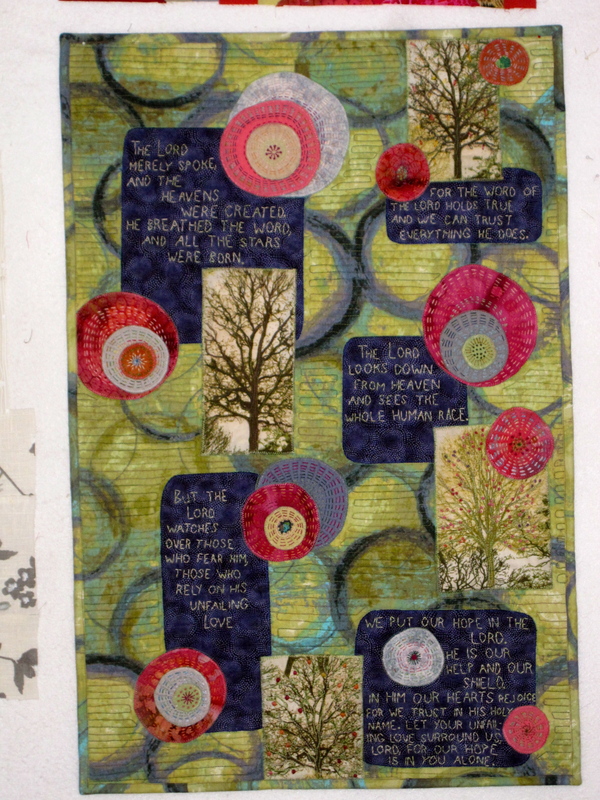 Hope in Uncertain Times, 18 1/2X28″, Machine appliquéd and quilted. Extensive hand embroidery. $500 Description: This quilt, and especially these words, were a direct response to the horrific events that happened at the Sandy Hook elementary school, which was followed closely by the Boston Marathon bombings and the explosions in Texas. I have friends in all those areas. I am a blogger, and everywhere I read, I could see the uncertainty that was expressed in the face of such events. I found these verses in the Psalms, and they brought me great hope. Through this quilt I have been able to share that same hope with many people.